This image shows a layer of the phase-transition material SmNiO3 placed on top of a Columbia Engineering School logo. 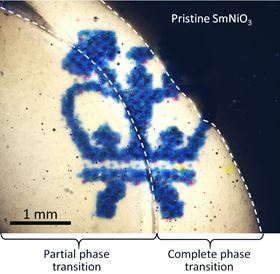 The transparency of the material can be controlled by electron doping under ambient conditions: pristine SmNiO3 is opaque; partial phase-transition makes the material translucent; and complete phase-transition makes it transparent. Image: Nanfang Yu, Columbia Engineering. A team led by Nanfang Yu, assistant professor of applied physics at Columbia University School of Engineering and Applied Science, has discovered a new phase-transition optical material. Using this new material, he has demonstrated novel devices that dynamically control light over a much broader wavelength range and with larger modulation amplitude than has currently been possible. The team, including researchers from the universities of Purdue, Harvard and Drexel, and Brookhaven National Laboratory, found that samarium nickelate (SmNiO3) can be electrically tuned continuously between a transparent and an opaque state over an unprecedentedly broad spectrum range. This stretched from the blue in the visible (wavelength of 400nm) to the thermal radiation spectrum in the mid-infrared (wavelength of a few tens of micrometers). The study, which represents the first investigation into the optical properties of SmNiO3 and the first demonstration of the material in photonic device applications, appears in Advanced Materials. "The performance of SmNiO3 is record-breaking in terms of the magnitude and wavelength range of optical tuning," Yu says. "There is hardly any other material that offers such a combination of properties that are highly desirable for optoelectronic devices. The reversible tuning between the transparent and opaque states is based on electron doping at room temperature, and potentially very fast, which opens up a wide range of exciting applications, such as 'smart windows' for dynamic and complete control of sunlight, variable thermal emissivity coatings for infrared camouflage and radiative temperature control, optical modulators, and optical memory devices." Some of the potential new functions include using SmNiO3's ability to control thermal radiation to build ‘intelligent’ coatings for infrared camouflage and thermoregulation. These coatings could make people and vehicles, for example, appear much colder than they actually are and thus indiscernible under a thermal camera at night. The coating could also help to reduce the large temperature gradients experienced by satellites by adjusting the relative thermal radiation from a satellite’s bright and dark sides with respect to the sun and thereby prolonging its lifetime. Because this phase-transition material can potentially switch between transparent and opaque states with high speed, it may be used in modulators for free-space optical communication and optical radar, and in optical memory devices. Researchers have long been trying to build active optical devices that can dynamically control light. Examples include: the ‘smart windows’ on the Boeing 787 Dreamliner, which can control (albeit not completely) the transmission of sunlight; rewritable DVD discs on which laser beams can write and erase data; and high-data-rate, long-distance fiber optic communications systems where information is ‘written’ into light beams by optical modulators. The reason why active optical devices are not more common in everyday life, however, is because of the difficulty in finding advanced actively-tunable optical materials and designing proper device architectures that amplify the effects of such tunable materials. When Shriram Ramanathan, associate professor of materials science at Harvard, discovered SmNiO3's giant tunable electric resistivity at room temperature, Yu took note. The two met at the IEEE Photonics Conference in 2013 and decided to collaborate. Yu and his students, working with Ramanathan, who is a co-author of this paper, conducted initial optical studies of the phase-transition material. They also integrated the material into nanostructured designer optical interfaces, or ‘metasurfaces’, and created prototype active optoelectronic devices, including optical modulators that can control a beam of light, and variable emissivity coatings that control the efficiency of thermal radiation. "SmNiO3 is really an unusual material," says Zhaoyi Li, the paper's lead author and Yu's PhD student, "because it becomes electrically more insulating and optically more transparent as it is doped with more electrons – this is just the opposite of common materials such as semiconductors." It turns out that doped electrons ‘lock’ into pairs with the electrons already in the material, a quantum mechanical phenomenon called ‘strong electron correlation’ that makes these electrons unavailable for conducting electric current and absorbing light. So after electron doping, SmNiO3 thin films that were originally opaque suddenly allow the transmission of more than 70% of visible light and infrared radiation. "One of our biggest challenges," Zhaoyi adds, "was to integrate SmNiO3 into optical devices. To address this challenge, we developed special nanofabrication techniques to pattern metasurface structures on SmNiO3 thin films. In addition, we carefully chose the device architecture and materials to ensure that the devices can sustain high temperature and pressure that are required in the fabrication process to activate SmNiO3." Yu and his collaborators next plan to run a systematic study to understand the basic science of the phase transition of SmNiO3 and to explore its technological applications. The team will investigate the intrinsic speed of phase transition and the number of phase-transition cycles the material can endure before it breaks down. They will also work on addressing technological problems, including synthesizing ultra-thin and smooth films of the material and developing nanofabrication techniques to integrate the material into novel flat optical devices. "This work is one crucial step towards realizing the major goal of my research lab, which is to make an optical interface a functional optical device," Yu notes. "We envision replacing bulky optical devices and components with 'flat optics' by utilizing strong interactions between light and two-dimensional structured materials to control light at will. The discovery of this phase-transition material and the successful integration of it into a flat device architecture are a major leap forward to realizing active flat optical devices not only with enhanced performance from the devices we are using today, but with completely new functionalities." This story is adapted from material from Columbia University School of Engineering and Applied Science, with editorial changes made by Materials Today. The views expressed in this article do not necessarily represent those of Elsevier. Link to original source.